Hannah Kinsman, the creator of the truly life changing – for a beauty lover - Take It Off makeup removal towels, says that since she was a teenager, “I have had a love for quality makeup and cosmetics but have always struggled with ‘taking it off’ at the end of the day”. Like myself, Hannah’s skin is extremely sensitive to many removal products and wipes, and in the past, no matter which products she tried, she would always seem to wake up “looking red, blotchy and somewhat like a panda with residue from the previous day's eye makeup that had failed to come off”. I know the feeling! Add to that a general dislike for chemical-heavy formulas and a refusal to use wipes due to their impact on the environment, and you have somewhat of a conundrum. Lucky for me then that after plenty of research and trialling of different cleansers and towels, Hannah launched Take It Off makeup removal towels, which are an absolute godsend – and perfect for travel. 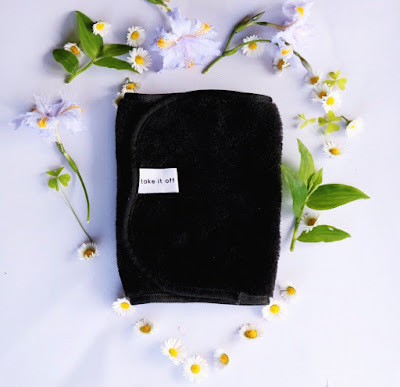 Take It Off makeup removal towels are made from the finest threads of polyester, where each thread is one hundred times thinner than a human hair. When woven together, they create a surface area significantly larger than that of traditional fibres, allowing them to attach themselves to the most microscopic specks of dirts and oils, and absorb them gently from your skin. To use one, you simply wet the towel with warm water, then gently massage your face and neck in circular motions - being extra careful around the eyes. You can rinse and repeat if you’ve been wearing formulas that are a little hard to budge, then off you go on your merry way applying your usual serums and creams. Magic! Always be sure to wash your towel before use, then every few days when needed, letting it air dry in between uses for the best result. I love that they provide an eco-friendly method of removing makeup, reducing waste and chemicals going into our waterways, are reusable and if they are well looked after, can last you years! A normal sized towel will set you back just $19.99, or $18.99 for a pack of mini towels that I have found have been amazing for travel. They save you a bunch of money, are kind on the planet AND properly work – it doesn’t get much better than that. Head here to get some for yourself – you won’t be disappointed!